Genesis Sonic 3 & Amy Rose in 29:27.58 by WST & marzojr. 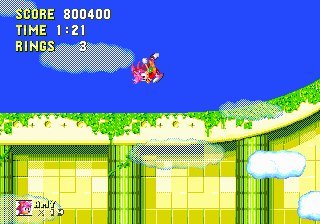 Another Sonic 3 & Knuckles TAS, but with Amy Rose this time. Unlike the three main characters, she wields a hammer as her weapon, and WST & marzojr use it to great effect in glitching through the game. For more details, see the run's comments. We also have runs with Sonic and Tails, Knuckles, Tails, Knuckles ring attack, Sonic 100%, Knuckles 100%, Competition mode and Sonic and Tails on NewGame+. Each second link or set of encodes uses a camhack, which forces the camera to focus on Amy while keeping the sprites on the foreground layer.